The Mind of a Helmet Camera Cyclist: Ton is Done! Woke up in the morning and to my surprise the bike was still there. Kick off was at 7:30 and I got into the second start group (about 30 riders). Started at a gentle enough pace, but it soon cranked up. I've never been in Peloton before and I seemed to get dragged into one that cranked up the speed. Wow, that was fun! We were coasting along from Stirling to the Dukes Pass at between 18-25mph on the flats. Yee haa! I was amazed at the difference that being in a group made. A huge one, and when I took the front (oh yes I did!) it was significantly harder. When behind other cyclists I found I could often freewheel and had to use the brakes a fair amount. The peloton broke up at the pass, or should I say I lost it. It's a fair hill, not one i have done before, but not as bad as I had feared. I was glad to get it out the way as I was familiar with the next big hill (Crow Road) and so I thought the rest would be relatively easy. Oh no. Oh, and I missed the piper at the top. Around Loch Katrine, was beautiful. Really, really beautiful scenery, If you haven't been there before, go there. Just be sure to avoid midge season. Today was midge season. It was a bit like cycling through a starfield screensaver, except it was midges. Oh and you couldn't see them, but you could feel them striking your face. I had to stop at one point just to scratch my head. The cycling around here also had some surprises in the shape of hills. Lots and lots of steep little energy sapping hills around every corner that don't seem to register on profiles! Following on from Dukes pass made them hard work, but it was a challenge after all! Passing back through Aberfoyle on the way back a small crowd of magnatom fans.... sorry I mean race supporters had gathered and cheered us on. Much appreciated. 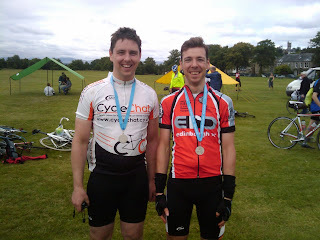 I also picked up a cycle buddy for a while who helped pull me along which was great (and hard at the same time, as I felt obliged to help out every once in a while and he wasn't a slow coach!). I pulled into the lunch stop, he didn't. He is a proper cyclist. Respect! Lunch was nice and it meant that I could check for texts and fix my tracker which appeared to have malfunctioned. Probably spent about 45 minutes here chatting, meeting folk from work who I didn't know were there! Onward and forward. Along a long stretch of the A81. Now it began to hurt. I don't think the rest had done any good and my legs were like lead. The A81 was also not the most inspiring road to cycle on (and quite busy with cars). It was a long slog into a newly developed head wind. It hurt for quite a while. It was hard. I just kept gong. Along here a friend from cyclechat popped up behind me, all smiles. He told me he started about 50 minutes after me. It hurt a bit more. I remembered how he had a dodgy hamstring and would be cycling at 75%. It hurt a wee bit more. I waved him on and off he shot. I hit bottom and swore. Barsteward! (Not personal of course!). I took some big gulps of my energy juice and after a while I got my second breeze. Things started picking up, which was good, especially with Crow Road on the horizon. I joined some roads I knew well and I got back into a rhythm. In fact I found myself encouraging another cyclist who was going through a rough patch. I got to Crow Road and buckled down, knowing what was ahead. Luckily the rhythm remained. It was hard. It was 'I have about 70 miles already in my legs' hard, but my legs knew what to do. Keep going. All credit to them, they did! I got to the car park - the false summit, which when you go past it reveals more big rises. Until today I have lost heart here and stopped. Not today. No way would it defeat me. And it didn't! Just after the car park another cyclechatter appeared behind me. He had popped out to say hi (not doing the trossachs ton). He accompanied me up the rest of Crow Road (sorry for the language!) and down the other side. He kept up most of the way. Then came the slog back to Stirling. With the big hill out the way it should be easy. Nope. Another one of those sections with short steep hills around every corner, and this went on all the way back to Stirling, about 15 miles. Now that section was HARD (and everyone said that at the end!). Not only that it had lots of loose stones which appeared on most of the downhills. Has any of the locals bought a lot of stone recently! I didn't hit a low like before but it was HARD. Did I say it was hard? Yes it was hard. The legs were sore and tired and my neck hurt on the downhills. I wasn't sure which was worse, my legs going uphill, or my neck going downhill. 100 miles came and passed (on a hill) and no sign of Stirling! What! A trick (or was it to do with shortcuts or long routes, but that is another story!). How much further!? 2.51 miles to be precise! The finished approached (which was on grass?!?!) and I crossed it without falling off! I did it! Back before lunch stop, fine after that. Numb fingers, but not a major problem. I am coping better with it. I have lots of midge bites!